Jordan’s coach has slammed Graham Arnold and the Socceroos for writing off their opponents. 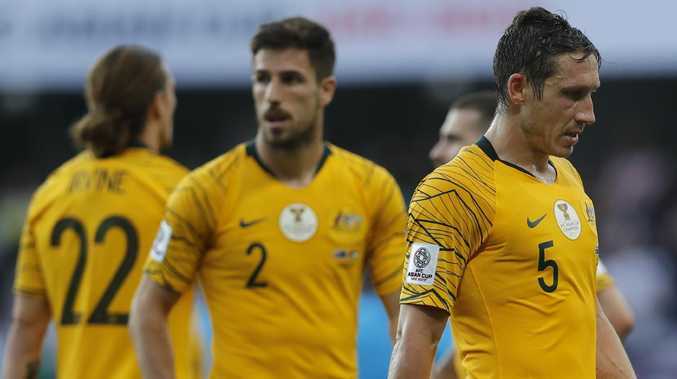 THE Socceroos' big talk of victory in the build up to their Asian Cup opener was "dangerous", according to Jordan coach Vital Borkelmans. Australia stumbled at the first hurdle in their title defence, falling 1-0 to a fired-up Jordanian outfit in Al Ain on Sunday. Comments such as "we expect to win" by coach Graham Arnold the day before the match were perceived as arrogance by Jordanian media. And a delighted Borkelmans issued a warning for Arnold following his team's win, which was achieved despite Jordan ceding 77 per cent possession to Australia. "It's very, very dangerous to talk like this," the Belgian said. "I say many times to my players, 'guys, no country is small. When you see the World Cup, big teams lose to small countries'. "When you put this (thought) in your players, they get so mentally strong that the performance is going up every minute in the game." Arnold denied his expectations were arrogance, simply a genuine belief in his team's abilities. "Belief is when you believe in something so strong then you believe in winning. It's not arrogance at all," Arnold said. Head Coach Vital Borkelmans has slammed the Socceroos’ pre-game talks. "Those words are used a lot in Australia and in Australia it's not considered as arrogant." Borkelmans lauded his team's tactical discipline in the victory, appearing to set a blueprint for Australia's other group stage rivals Palestine and Syria. Jordan were happy to ignore Australia's defence on the ball before springing into action whenever the midfield trio of Mark Milligan, Tom Rogic or Massimo Luongo received the ball. "For many days I was training on the players who most make the actions on the Australian team," Borkelmans said. "I say to my players when these three guys have the ball, make pressure on these guys. "All my team made a big, big, big tactical performance."